Safari Madness Classic Slot Review - Casino Answers! Safari Madness is a 9-reel, 8-line classic slot machne developed by Net Entertainment. 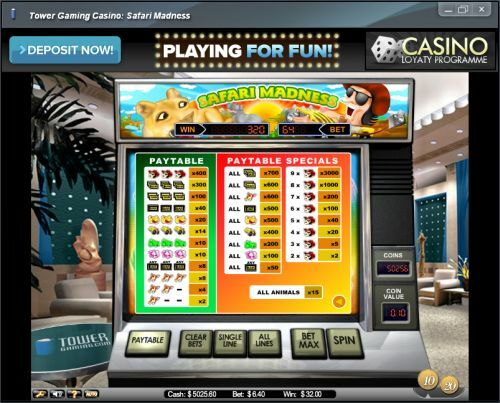 You can play the Safari Madness classic slot machine at Bovada. Coin values on the Safari Madness slot machine are $0.01 and $0.20. You can select 1-8 paylines and bet 1-10 coins per line. Unless you are playing the maximum bet, you can only select your bet with the “Single Line” button, so you have to be careful with how many times you press the “Single Line” button. You can bet as little as a dime on the Safari Madness slot game or as much as $12.80. Safari Madness has a low betting range that is best suited for casual players. You can manually skill stop the reels of Safari Madness by pressing the “Spin” button in mid-spin. To play Safari Madness, select your bet and press the “Spin” button. To play the maximum bet of $6.40 or $12.80, press the “Bet Max” button. The highest paying symbol on the Safari Madness classic slot game is the Safari Ranger symbol. If 9 Safari Ranger symbols land on each of the reels on Safari Madness, you will win the 3000 coin top jackpot. The highest single line payout on Safari Madness is 400X for 3 Safari Ranger symbols on a selected payline. You can win these payouts by playing Safari Madness at Bovada! There are 12 regular winning combinations on the Safari Madness 8-line slot machine. The regular payout schedule is as follows (payouts in parenthesis): 1 Giraffe symbol (2), 2 Giraffe symbols (4), 3 Giraffe symbols (8), 3 of any Bar symbols (8), 3 Hippo symbols (10), 3 Crocodile symbols (10), 3 Jeep symbols (14), 3 Lion symbols (20), 3 Single Bar symbols (40), 3 Double Bar symbols (100), 3 Triple Bar symbols (300) and 3 Safari Ranger symbols (400). Safari Madness has an autoplay mode that can be opened up by hitting the “Auto” button. You can play 10, 25, 50, 75, 100, 250, 500, 750 or 1000 autoplay spins at a time. In the advanced settings, you can set Safari Madness autoplay mode to stop on any win, if free spins is triggered, if the jackpot is won, if a single win exceeds (any amount you input) and if cash increases/decreases by (any amount you input). You can stop the autoplay mode at anytime on the Safari Madness online slot. 8-line slots are very popular and Safari Madness is part of the reason why. This unique slot machine is a very fun slot to play, especially if you are interested in safari animals. You can play the Safari Madness 8-line slot machine when you sign up and make a deposit at Bovada. Are USA players able to play Safari Madness for real money? No, American players cannot play the Safari Madness online slot game for real money at this time. For some unique USA-friendly slots you can play, please visit Slotland Casino. Where can I play a free Magic Love Flash game? You can play the Magic Love Flash game for free at Tower Casino. You can play for free or real money. If you experience any difficulties with the Flash software, make sure you’re using the latest version of Adobe Flash Player.